On May 2nd the four players with the most club appearances for Arsenal were profiled, between them they played in an incredible 2.631 games. David O’Leary 1973-1993 made 722 appearances. 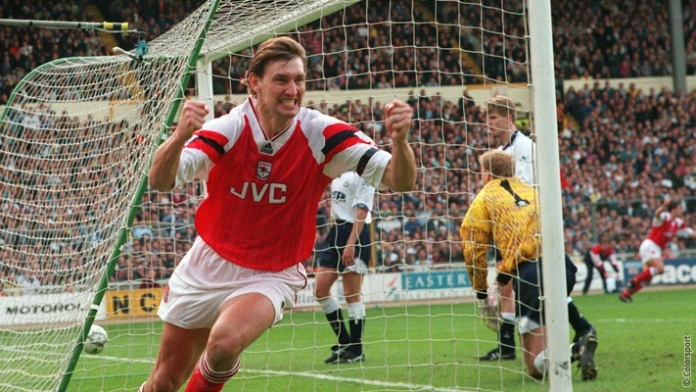 Tony Adams 1983-2002 made 669 appearances. George Armstrong 1961-1977 made 621 appearances. Lee Dixon 1988-2002 made 619 appearances. Now we will take a look at the next four players with the highest amount of appearances, they are the only players to have played in between 500 and 599 games. 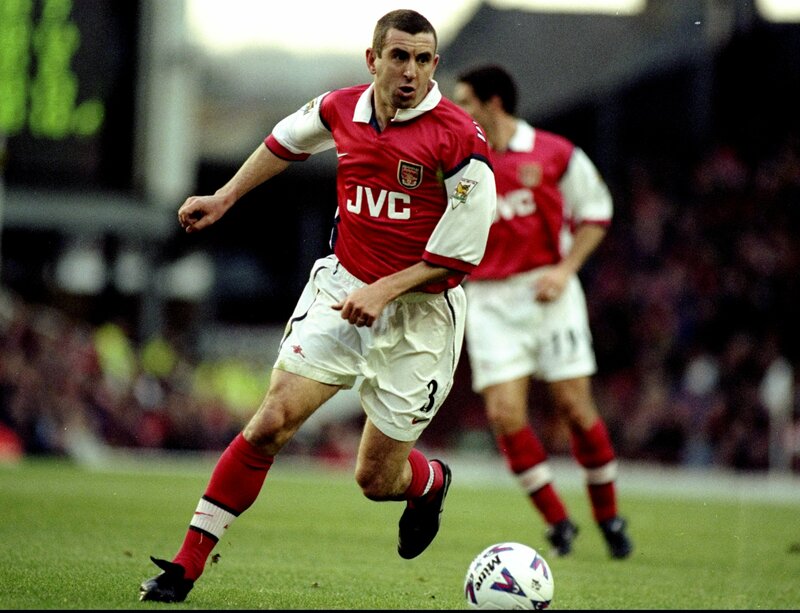 First up we have Nigel Winterburn 1987-2000 he made 584 appearances. Winterburn began his Arsenal career at right-back, an emergency measure employed by Graham after he’d been unsuccessful in finding a worthwhile replacement for Viv Anderson. Though heavily left-footed, Winterburn settled into the right back role as best he could and became quickly involved in two controversial incidents of his first season. 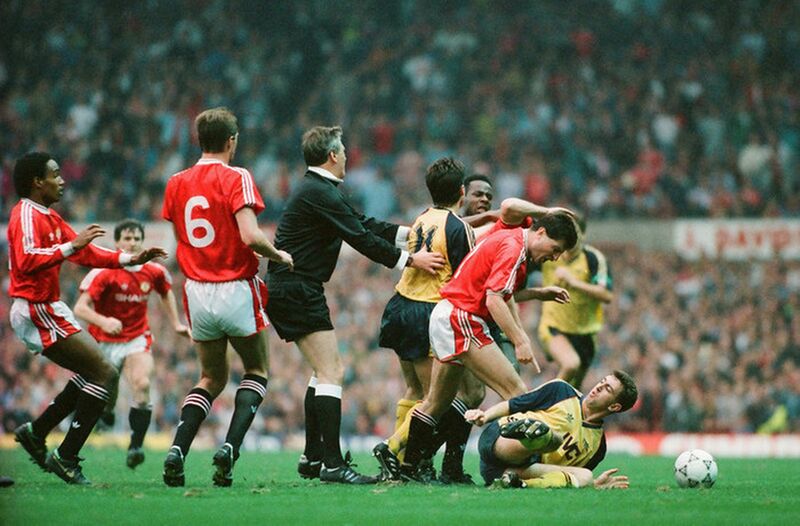 First, he was seen to openly goad Brian McClair after the Manchester United striker had missed a late penalty in an FA Cup tie at Highbury.The second incident came in the League Cup final later that same season. Despite having fallen behind in the early stages, Arsenal, the holders, dominated the match and were leading Luton Town 2–1 at Wembley with less than quarter of an hour to go when David Rocastle was felled in the penalty area. Michael Thomas had been Arsenal’s designated penalty taker all season but for reasons unexplained, it was Winterburn – who’d never taken a penalty for Arsenal before – who collected the ball up to take the kick. He put the kick low and strong to the right hand corner as he viewed it, but Luton goalkeeper Andy Dibble guessed correctly and pushed the ball round the post. A newly-inspired Luton then scored twice in the final ten minutes and won the final 3–2. Despite the missed penalty, it was Gus Caesar (deputising for David O’Leary who missed the final due to injury) rather than Winterburn who was made to bear the brunt of the criticism, as he had made the error which gifted Luton their equaliser at 2–2. Sansom left Arsenal in the summer and Winterburn settled into his more familiar left back role as a result, staying in it for more than a decade. He and fellow full back Lee Dixon flanked two superb central defenders in captain Tony Adams and veteran David O’Leary, joined during the 1989 season by Steve Bould. Often the manager would play all five of them as Arsenal took holders Liverpool to a last-game showdown at Anfield for the First Division title, which would have been Arsenal’s first title since the Double year of 1971. Arsenal’s situation meant they needed to win by at least two clear goals to clinch the championship. Winterburn’s free kick set up a first for Alan Smith shortly after half time, but the second looked as though it would elude them until Thomas scored in injury time. This victory was the culmination of the film Fever Pitch. Arsenal ended 1990 trophy less, but went on to win the league title again the next year, with only one loss. Two years later, Winterburn was in the Arsenal team which won both cup competitions and thus completed his domestic set of medals. Arsenal defeated Sheffield Wednesday 2–1 in both the League Cup and FA Cup finals, the latter in a replay. Arsène Wenger arrived at Arsenal at the end of 1996 and instilled new self-awareness and dietary habits into the Arsenal squad, allowing the ageing defence (Adams was the youngest at 30 years of age; Martin Keown had also arrived to account for O’Leary’s retirement after the 1993 FA Cup success) to thrive in the latter years of their careers and prolong their football careers. Arsenal won the “double” of Premiership and FA Cup in 1998. 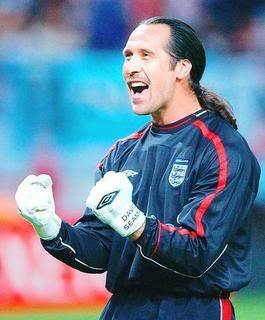 Secondly we have David Seaman MBE – 1990-2003 he appeared in 564 games. Arsenal manager George Graham signed David Seaman from Queens Park Rangers in 1990 for a fee of £1.3 million; at the time a British record for a goalkeeper. Arsenal sold goalkeeper John Lukic, who was highly popular amongst Arsenal fans, to Leeds United. Seaman’s time at Arsenal coincided with one of the most successful periods in the club’s history. The 1990–91 season saw him concede only 18 goals when playing in every match of the 38-game season as Arsenal regained the league title. Arsenal won both the FA Cup and the League Cup in 1993 and supplemented this a year later with the European Cup Winners’ Cup. In 1995, George Graham was sacked, and Arsenal came close to becoming the first club to retain the Cup Winners’ Cup, with Seaman earning a reputation as a penalty-saving specialist after saving Attilio Lombardo’s shot in Arsenal’s semi-final shoot-out against U.C. Sampdoria. However, in the final Arsenal lost in extra time to Real Zaragoza, with a spectacular last-minute goal from Nayim from 45 yards out catching Seaman off his line. There were only seconds left of extra time when Seaman conceded. In August 1996, Arsène Wenger became the new manager of Arsenal. Wenger rated Seaman highly and in 1998, Seaman helped the team to the Premier League and FA Cup double. In 1998–99, Seaman played all 38 league matches, conceding only 17 league goals as Arsenal came within one point of retaining the Premier League and lost in the FA Cup semi-finals to Manchester United. The following season Seaman managed to reach the 2000 UEFA Cup Final, which Arsenal drew 0–0 with Galatasaray, but lost on penalties. In 2002, Seaman won the Premier League and the FA Cup again to complete his second career double, although Arsenal’s other goalkeepers Stuart Taylor (10 appearances) and Richard Wright (12 appearances) also won championship medals, due mainly to Seaman’s absence through injuries. A highlight of this season was when Seaman dramatically saved a Gareth Barry penalty as Arsenal won 2-1 at Aston Villa. Despite his international career ending so flatly and accusations his mobility had faded with age, the 2002–03 season—Seaman’s last at Arsenal—ended on a high note. In the FA Cup, he made a spectacular save against Sheffield United’s Paul Peschisolido in the semi-finals, in what former Manchester United goalkeeper Peter Schmeichel, a pundit for the BBC on the day, dubbed “the best save I’ve ever seen”. Arsenal were defending a 1–0 lead, when with less than ten minutes to go, Peschisolido had a header towards an apparently open goal from six yards out with Seaman seemingly stranded at the near post. However, the goalkeeper leapt sideways and backwards, somehow managing to stretch his right arm behind him and scoop the ball back and away from both his goal and the opposing players ready to pounce on a rebound. The match was all the more remarkable in that it was Seaman’s 1,000th professional career game. Seaman went on to captain the team during the 2003 FA Cup Final in the absence of injured Patrick Vieira and keep another clean sheet at the Millennium Stadium as they defeated Southampton 1–0. His final act with Arsenal was to lift the FA Cup, which was his eighth major trophy with his team. David became an MBE in 1977 – unfortunately GN5 could not find an image of the presentation. 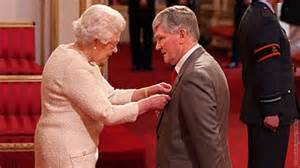 Thirdly we have Pat Rice MBE – 1964-1980 he made 528 appearances. Born in Belfast, he grew up in London, and after working at a greengrocer on Gillespie Road he joined the Gunners as an apprentice in 1964. He turned professional in 1966 and worked his way up through the club’s youth and reserve teams. He made his first-team debut in the League Cup against Burnley on 5 December 1967. Playing at right back, Rice was initially a bit-part player, making only 16 appearances in his first three seasons at Arsenal, and missed out on Arsenal’s 1969–70 Inter-Cities Fairs Cup win over RSC Anderlecht. Peter Storey was Arsenal’s first choice right back, but after he was moved into central midfield at the start of the 1970–71, Rice took his place and was a near-ever present in the side that season, as Arsenal won the League and FA Cup Double. He remained first-choice right back for the rest of the 1970s, playing in the 1972 FA Cup Final as well; he was an ever-present for three seasons — 1971–72, 1975–76, 1976–77. Of the Double-winning side, he was the one who remained at the club the longest, and became club captain in 1977. As captain, he had the honour of lifting the FA Cup after Arsenal beat Manchester United in 1979, as well as losing two finals in 1978 and 1980. He is one of only 3 Arsenal players to have played in five FA Cup Finals (1970–71, 1971–72, 1977–78, 1978–79, 1979–80), the other two being David Seaman and Ray Parlour. He also led Arsenal to the 1980 UEFA Cup Winners’ Cup Final, which Arsenal lost on penalties to Valencia. He finally left Arsenal in 1980 at the age of 31, by which time he had played 528 games in total for the club. Pat rejoined Arsenal in 1984 as youth team coach, a post he held for the next 12 years, winning the FA Youth Cup twice in 1987–88 and 1993–94. In September 1996, he was briefly caretaker manager of the club after the resignation of Stewart Houston, who himself was caretaker after the sacking of Bruce Rioch. He managed the side for three FA Premier League matches (all of which Arsenal won) and a 3–2 defeat in the UEFA Cup at home to Borussia Mönchengladbach. Upon the arrival of Arsène Wenger at the end of the month, Rice became his assistant, and played a key role in helping the club to their success in the 1990s and 2000s, including the Doubles of 1997–98 and 2001–02, and Arsenal’s unbeaten League season of 2003–04. He holds the distinction (along with Bob Wilson) of having taken part, as player or coach, in all three of Arsenal’s Doubles. Rice was appointed Member of the Order of the British Empire (MBE) in the 2013 New Year Honours for services to sport. Last but not least we have Peter Storey 1961-1977 who played in 501 games. Storey signed as an apprentice at Arsenal after leaving school in 1961. He signed professional forms in September 1962 and spent the 1962–63 season playing for the Arsenal third team in the Metropolitan League. He made his senior debut on 30 October 1965, taking Billy McCullough’s place at left-back in a 3–1 defeat to Leicester City at Filbert Street. He retained his first team place and went on to play all of the remaining 29 games, though the season would prove to be a poor one for the “Gunners” as manager Billy Wright was sacked after dropping top-scorer Joe Baker and disillusioning the dressing room. In 1965-66 Arsenal finished in 14th place, just four points above the relegation zone, and was knocked out of the FA Cup at the Third Round following a 3–0 defeat to Blackburn Rovers, who would end the season bottom of the First Division. Storey quickly made a name for himself as a rough player early in the 1966–67 season as he injured Manchester City winger Mike Summerbee. He was warned by new manager Bertie Mee not to get sent off after Storey got involved in a brawl during an FA Cup win over Gillingham. The team improved under Mee’s strict leadership, and finished the season in seventh place, cutting goals conceded to 47 from the previous season’s tally of 75. Storey started 34 league games, missing eight matches due to injury and illness. He scored his first professional goal on 22 April 1967, in a 1–1 draw with Nottingham Forest at Highbury. Bob McNab established himself at left-back in the 1967–68 season, and so Storey was moved over to right-back. Despite being a full-back he was sometimes given the job of marking a dangerous and creative opposition player closely, and though he was never ordered to use rough play he was on these occasions told “you know what to do, Peter”. He was sent off for the first time in his career, along with Frank McLintock, in a 1–0 defeat to Burnley at Turf Moor in December 1967; despite his tough tackling he was actually dismissed for bad language. Arsenal finished the season in ninth place, but advanced past Coventry City, Reading, Blackburn Rovers, Burnley and Huddersfield Town to face Leeds United in the final of the League Cup at Wembley. Leeds won the game through a Terry Cooper volley on 20 minute. Their league position meant in 1968–69 that Arsenal qualified for the Inter-Cities Fairs Cup in the 1969–70 season, and they advanced past Glentoran (Northern Ireland), Sporting (Portugal), Rouen (France), FCM Bacău (Romania) and Ajax (Netherlands) to reach the final against Belgian club Anderlecht. Anderlecht won 3–1 at the Constant Vanden Stock Stadium after their possession football controlled the entire game until substitute Ray Kennedy scored a crucial header in the 82nd minute. Arsenal turned around the tie with a 3–0 home victory to claim the club’s first trophy in 17 years. Despite their European exploits the team still struggled in England, and finished the league in 12th spot. Arsenal won the 1970-71 title on the final day of the season with a 1–0 win over Spurs at White Hart Lane, though Storey missed the final two league games of the season after damaging ligaments in his ankle. They secured the double after winning the FA Cup, though their progress in the competition was slow, as they beat Yeovil Town, Portsmouth (in a replay) – Storey scored a penalty in both the original tie and the replay, Manchester City, Leicester City (in a replay), and then Stoke City (in a replay). Storey gave a man-of-the-match performance in the original semi-final tie against Stoke at Hillsborough, scoring two goals to rescue a 2–0 half-time deficit; with the first goal he beat Gordon Banks with a volley on the edge of the penalty area, and with the second he sent Banks the wrong way with an injury-time penalty kick. The replay at Villa Park was less dramatic, and Arsenal won the tie with a comfortable 2–0 result. In the final he was assigned to mark Liverpool’s Steve Heighway, and kept the Liverpool winger quiet until Storey was substituted for Eddie Kelly after 64 minutes. Both Heighway and Kelly scored in extra-time, but the winning goal came from “Gunners” striker Charlie George. 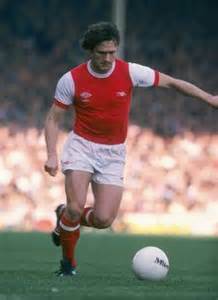 He played his final game for Arsenal on 29 January 1977, replacing Malcolm Macdonald as a substitute in a 3–1 victory over Coventry City in the FA Cup. 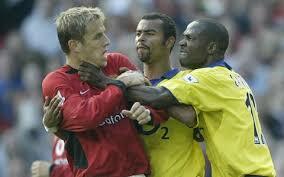 Today you get to vote for your favourite defenders from Arsenal’s modern era. The articles published on Tuesday, Wednesday and Thursday of this week provided in depth profiles on our best defenders spanning from Peter Simpson who played his first game in 1960 to the present day. To provide a broader picture of readers’ preferences, you can vote for up to 3 players in this poll. Thanks to GunnerN5 and Gooner In Exile for this excellent series of posts providing a forensic analysis of the best players in Arsenal’s history. Today we conclude the defence …. next week we start the midfield. Nigel played in 584 games over a 13 year period. He was born in Arley, Warwickshire and began his career with Birmingham City gaining his first youth caps for England while with the club. He left to join Oxford United and then in 1983 he was signed on a free transfer by Wimbledon who gained promotion to the First Division in 1986, at the same time Nigel won England under-21 honours. Nigel was the Wimbledon supporters, Player of the Year, for each of the four seasons he spent at Plough Lane. Arsenal, who was looking for a long-term replacement for Captain Kenny Sansom, paid Wimbledon £350,000 in the summer of 1987 and Nigel became an Arsenal player. He began his Arsenal career at right-back even though he was heavily left-footed. When Sansom left Arsenal Nigel moved to his more familiar left back role and stayed there for more for more than a decade. He and fellow full back Lee Dixon flanked central defenders Tony Adams and David O’Leary later being joined by Steve Bould, George Graham would often play all five of them as his defensive unit. They played together. as Arsenal beat holders Liverpool to a last-game showdown at Anfield for the First Division title, he made his England debut later that same year. Arsenal ended 1990 trophy less, but went on to win the league title again the next year, with only one loss. Two years later he was in the Arsenal team which won both cup competitions and thus completed his domestic set of medals. Arsenal defeated Sheffield Wednesday 2–1 in both the League Cup and FA Cup finals. In 1994, Arsenal beat Italian side Parma’s 1–0, to win the European Cup Winners Cup, Arsenal’s first success continentally for a quarter of a century. Arsène Wenger arrived at Arsenal at the end of 1996 and instilled new self-awareness and dietary habits into the Arsenal squad, allowing the ageing defence to thrive in their latter years and prolong their football careers. Arsenal won the “double” of Premiership and FA Cup in 1998 and in 2000 they reached the UEFA Cup final. He played in 429 matches for Arsenal placing him the fourth on the all time list. Tony played in 669 games over a 19 year period. Born in Romford, London, Tony grew up in Dagenham before signing for Arsenal as a schoolboy in 1980. He made his Arsenal first team debut in November 1983 just four weeks after his 17th birthday and became a regular player in the 1985–86 season, winning the Football League Cup Final, his first major trophy, in 1987. Alongside Lee Dixon, Nigel Winterburn and Steve Bould, he was part of the “famous back four” that lined up in Arsenal’s defence – they became renowned for the use of their well-disciplined offside trap. On 1 January 1988, he became Arsenal captain at the age of 21 and remained as such until his retirement 14 years later. Their, strong and disciplined defence was a major a factor in Arsenal winning the League Cup in 1986–87 followed by two First Division championship titles; the first in 1988–89 and the second in 1990–91 after losing only one game all season. In 1992–93 he became captain of the first English side to win the League Cup and FA Cup double, and he lifted the European Cup Winners’ Cup the following year. All along Tony had a ghost in his closet, namely his battle with alcoholism, which started in the mid-1980s and became increasingly worse; reportedly he was often being involved in fights in nightclubs. On 6 May 1990, he crashed his car and when breathalysed his blood alcohol level was found to be more than four times the legal drink-drive limit, in December of that year, he was found guilty and he was imprisoned for four months. Unfortunately his alcoholism continued and he was involved in further alcohol-related incidents. In September of 1996, he went public admitting that he was an alcoholic and was receiving treatment. Since his recovery he has become one of the most high-profile recovering alcoholics in the UK and his battle with alcohol is detailed in his autobiography, “Addicted”. The arrival of Arsène Wenger as Arsenal manager in October 1996 was also played a significant part in his recovery as Wenger reformed the club’s dietary practices and the players’ lifestyles. Wenger showed his faith in Tony by sticking by him and keeping him as the club’s captain, the improvements in the regime probably helped to extend his career by several years. Arsene’s trust was rewarded with Tony captaining the club to two Premiership and FA Cup Doubles, in 1997–98 and 2001–02 – he is the only player in English football history to have captained a title-winning team in three different decades. In August 2002, just before the start of the 2002–03 season, he announced his retirement from professional football after a career spanning almost 20 years in which he played 668 matches for Arsenal making him second on the all time appearance list, he is also the most successful captain in the club’s history. He made his debut for England against Spain in 1987, and played in Euro 88, scoring one of England’s two goals. He was the first player to represent England who had been born after the 1966 World Cup win. In total he appeared 66 times for England. Nicknamed “Mr Arsenal”, he was honoured by Arsenal with a testimonial game against Celtic in May 2002 with many Arsenal legends playing, including Ian Wright, John Lukic and Adams’s fellow back four stalwarts, Dixon, Winterburn and Bould. The game finished 1–1 with Lee Dixon, in his final appearance for the Gunners, getting their goal. In 2004, Tony was inducted into the English Football Hall of Fame in recognition of his impact on the English game. A statue of Adams was placed outside Emirates Stadium in celebration of the club’s 125th anniversary on 9 December, 2011. He has also been honoured with the MBE for his contribution to football. Lee played in 619 games over a 14 year period. Born in Manchester, he was a boyhood Manchester City supporter. He began his professional playing career in the lower divisions joining Burnley as an apprentice in 1980, turning professional in 1982 after which he played for Chester City and Bury before joining Stoke City in 1986. His performances attracted the attention of Arsenal and he was signed by Arsenal boss George Graham in 1988 following the departure of England right back, Viv Anderson, to Manchester United. This was the first time that he had played in the First Division and it took a while for him to be given a first team role at Highbury. 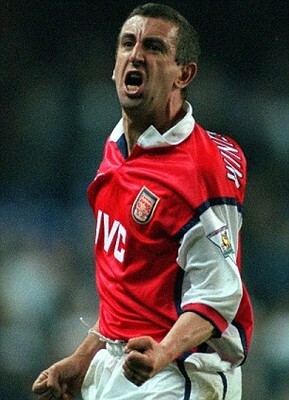 Nigel Winterburn had been a guarded success in the unfamiliar role of right back, though Lee did make his debut against Luton Town in February 1988 and played six times in total before the season ended. In the new season, Winterburn moved across to left back, allowing Dixon to take over the No.2 shirt, which he duly did for well over ten years. He and Winterburn made the full back positions their own for the next decade or so, while Captain Tony Adams and the long-serving David O’Leary operated in the middle. Later in 1988 they were joined by Steve Bould who, like Dixon before him, had been spotted by Graham playing for Stoke City. These five defenders, often playing as a back five together and were the foundation stones of much of Arsenal’s success. He wrote in his column in The Independent of the defence that he played in at Arsenal. His career at Arsenal saw him collect four league champion’s medals, three FA Cup winner’s medals and a UEFA Cup Winners’ Cup medal. He was named in the PFA Team of the Year twice, for the seasons 1989–90 and 1990–91. His retirement came at the end of Arsenal’s domestic double-winning 2001–02 season, their second in his time at the club. He made his England début in April 1990 in a World Cup warm-up game against Czechoslovakia, ending up with a total of 22 caps. His 619 appearances for Arsenal place him third on the all time list. Martin played in 449 games over a 23 year period. Born in Oxford, Martin first played for local sides and his local Gaelic football team, before joining Arsenal on a schoolboy contract in 1980; he made his professional debut while on loan at Brighton & Hove Albion in 1984. His debut for Arsenal came in November 1985, when Don Howe was still manager. He played 22 league games that season but when George Graham became manager in 1986, he decided that Martin was not part of his plans and sold him to Aston Villa for £200,000. Villa was relegated after finishing bottom of the First division on 1986-87. After Graham Taylor was appointed manager Villa won promotion back to the First Division, Martin helped them secure their top flight status the following season, but was sold to Everton in 1989, following which Everton sold Martin back to Arsenal in 1993. This move created intense competition for the central defensive positions between himself, Andy Linighan, Steve Bould and Captain Tony Adams, for places in the centre of one of the best English defences of the 1990s. He rarely missed a game in his first four full seasons back at Highbury, though he was used sparingly by Arsene Wenger in the 1997–98 double winning campaign, playing just 18 times. But Martin still claimed the first two major trophies of his career, after well over a decade of waiting. He went on to became a key player in Arsène Wenger’s double winning sides of 1998 and 2002, he remained as a first team regular until the end of the 2002–03 season, when the Gunners won their ninth FA Cup. Martin remained at Arsenal until 2004, winning another Premier League title, before being released on a free transfer. 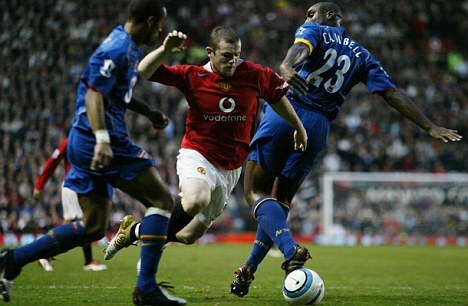 His final season he made 10 league appearances – the minimum to qualify for a title winner’s medal. On his release he signed for Leicester City, but left after less than six months and signed for Reading in January 2005, he played until the end of the season and then he retired. He made his England debut in 1992 against France, earning a total of 43 caps. His 449 appearances for Arsenal place him ninth on the all time list. Arsenal.com are currently running an all time dream team vote. The problem with this it is often only the young who vote and recent memory can skew the result. We have a wide church here with regard to ages so how about we all pick our all time eleven, manager, coach, physio and you can even throw in a few squad players. One stipulation you must have seen them play or manage whilst you’ve been alive. On second thoughts this could put the younger members of the forum at a disadvantage so perhaps we can allow two wild cards for positions where you believe a player from before your time may have added some. That was tough and I’ve only been watching them for 29 years, good luck to our older supporters. So just to say I know that’s not going to be everyone’s cup of tea but hey it’s my fantasy you all get to have yours too. 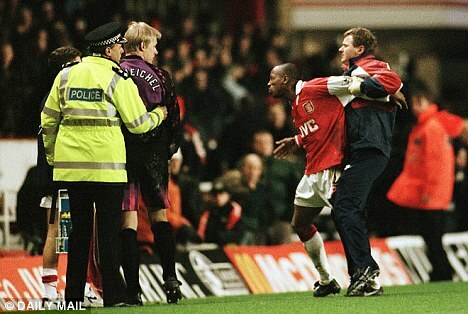 Wright……his pure enthusiasm for the game, affinity with the fans and love of scoring goals and also because of that goal against Big Nev, the whole of Highbury singing Ian Wright Wright Wright for a good ten minutes after he scored it. Limpar…..I was there when he beat Hooper from the halfway line and it was probably the best goal I ever witnessed at Highbury. Caesar…..you have to have an anti hero to have a hero, he was always good for a laugh (unfortunately for him we weren’t laughing with him). So there is the challenge pick away. Don’t ask me to justify my selections I made them in five minutes and will probably change them every ten.